Designer-Interview: In our series “10 questions” we’d like to introduce members of the designenlassen.de community. For this interviews we choose people, who are notably active on designonclick.com and impress us regularly with their great work. This time OMRAM will answer a few questions. For how long have you been working as a graphic designer? 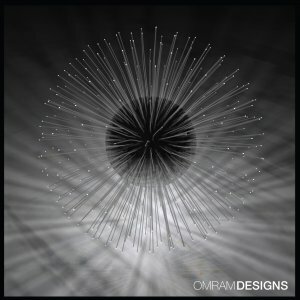 I’m a graphic designer for 15 years now. I’ve been a retail designer and interior architect before I got fully involved into the graphic designs. I’m not sure there’s really a recipe. As many of my fellow designers here, we could say that randomness and luck is very important to us in each contest. But my job is basically to minimize that randomness. Sometimes I’m very happy with a design and it’s simply rejected by the contest holder. Sometimes the opposite happens, I don’t believe much in a design, but still try to make a good and professional proposal and it becomes a better one with the help of the client. In fact, to be able to start a conversation with a client is the real and first challenge, then to answer him to all his needs and answers, creatively speaking or by reassuring him with technical points. Once a relationship is engaged, I think I’m trying my best to be very responsive and give my best for each client. Which experiences did you gain with designonclick.com? To participate here also pushes me to believe in each design I could make, because basically all the designs have the same chances from the beginning. You just need to meet the client’s expectations and I can’t simply tell which one will be a good one for the client, when I’m starting a contest. A good idea with a “bad” sketch can be a good start, but a bad idea, even with a good design, barely wins. Of course, working as a freelancer already offers great opportunities, but with working on designenlassen.de those opportunities get multiplied. Indeed there are many different kinds of jobs, offers and ways to express our creativity, so this is always a challenge. Because of the high number of contests you are privileged to pick those, where you think you can bring something good or challenge yourself (as I’ve explained). Was it possible for you to get follow-up jobs because of designonclick.com? I had some jobs beyond the contests I’ve won, with clients who were believing in my work and also because it was the extension of an existing contest, so it was easier for the clients to work with the same designer. Actually there are no particular rules. I presume instincts and experiences guide me. Sometimes a font itself is a starting point, sometimes the field of activity of the client, sometimes just a word in the brief brings the main idea. Then, it’s more like developing the concept or initial idea and trying to go beyond that first idea, too. In other situations, when the client knows exactly what he needs, I’m trying to be as precise as possible. Sometimes it’s also difficult to rethink the project, when you’ve explored some creative paths, but didn’t answer the client’s expectations. In fact, I’m always hoping the next design will be my favourite one. It’s my motivation, I’m more involved in new ideas or challenges, rather than looking back. I wish, I could show you my favourite design, but I think the most important thing is, that those designs have met the client’s expectations and will give the company a fresh start or be explicit enough to be recognized. I think when this is done, we can be proud of this design. If it’s your passion, don’t doubt yourself and face the upcoming challenges.The job forces you to challenge yourself in a creative way. To be able to realize your ideas, it’s important to acquire the technical know-how as well, which you will gain step by step. It’s a great job!